Samurai Princess is a game that fans that love to play online slot games will really enjoy. This beautiful artistic NextGen will transport the player to Japan many years ago when samurai warriors were commonly seen. 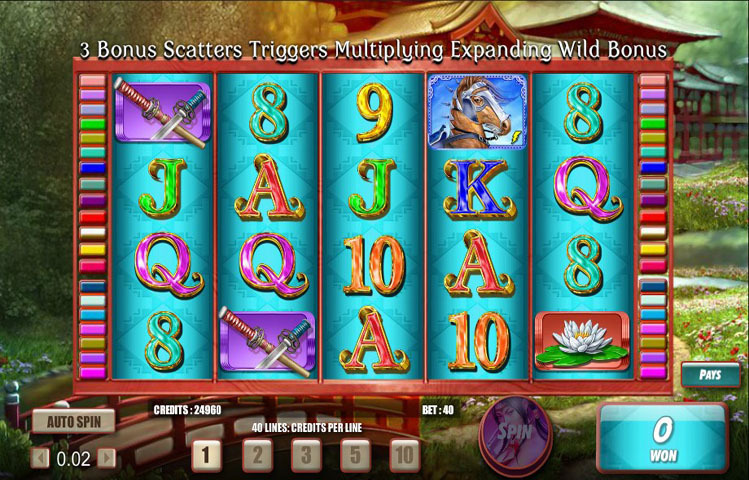 In this online slot game the main character is a beautiful samurai warrior princess. She is good and rewards the players with the gift of free spins as long as the player spins the right combinations. There are 40 pay pattern configurations. These patterns include a Dragon Serpent, a Lotus Blossom land, and a pair of Samurais. The patterns are the top winning combinations. The scenery shows a traditional Japanese building and garden. The artwork and graphics have an alluring appeal look. The Samurai Princess has a greater influence on the bonus round. The player has the option of clicking on the Samurai Princess to spin or the player can spin on auto. Auto allows the player to have the spin automatically and the auto will continuously spin 5, 10, 20, 50 or 100 times. The intoxicatingly beautiful Samurai Princess image where she is holding the sword can serve as a substitute for another symbol. A Samurai Princess Wild has its wonderful rewards. If the symbol lands in groups of 2,3 4 or even 5 it can be very rewarding for the player. They can win 5, 125, 500 or 1000 coins. The longest winning combination is best for the player in the payline because they are more likely to benefit more with the winning the coins. Slot players will enjoy the win boosting powers more in the free round. The player may spin and land on a pretty totem horse. Overtime the horse totem comes into view it is highlighted. The horse also activates the main features of the game. The symbols that are viewed to be in the lower value are the typical letters and numbers 8, 9, 10, J, Q, K and A. The higher valued symbols are a white lily, a blue and gold dragon and the Japanese Katanas. The bonus feature is where the horse symbol lands three or four times anywhere on the reel. The player can win the scatter prize, which will enable the player to get seven free spins. The player will be able to get a wild when spinning on reels two and four to generate a winning combo. This will help the player get a multiplier twelve times for the win. The slot player can win a little or a lot of the paylines to enable their chances of winning by getting free spins. This activates the scattered symbols. The more the player plays the higher the winning prize is going to be. Samurai Princess is a nice game with beautiful graphics. The princess and the scenery will keep online slot player playing. It is an exciting game that makes a player feels excited at every spin. There are certain demographics of slot players that this game will appeal to. The Samurai Princes is a reel good online slot game.